Even if you love to iron, no one wants more wrinkles in clothes. For decades, housewives spent hours ironing each week. But with today's newer fabrics and modern laundry appliances, ironing has taken a back seat in the laundry routine. However, we can all admit that there are times that we head out the door with more wrinkles in our clothes than we'd like. Here are five clothing care and laundry tips that will help you look your best with as little ironing as possible. One of the first things that we learn (or should learn) in doing laundry is to separate clothes by color. Whites with whites, darks with darks. But for best results in preventing wrinkles, clothes should be separated not only by color but also by fabric content and weight. For instance, washing lightweight dark cotton t-shirts with heavy denim jeans can cause lighter items to be crushed in the washer by the weight of the jeans causing more wrinkles. By having your laundry sorted correctly before washing, you will also reduce wrinkles in the dryer. Lightweight items dry much quicker than heavier fabrics like denim. The more time fabrics spend in the dryer, the more likely they will be overheated and wrinkles become deeply set. Most dryers, gas or electric work the same way: to heat air, a dryer drum to tumble clothing through the warm air and an exhaust system to vent the moisture drawn from the fabric. But, there are differences in the heating and cool down cycles that can determine whether your clothes come out deep wrinkles or wrinkle-free. The permanent press cycle has a gentle cool down time period that is best for synthetic fabrics that don't need higher heat. The cooling down period lets the fibers relax to their original shape. Even cotton and linen fabrics that can be dried on high heat should not be allowed to overheat because wrinkles will be deeply set and require more ironing to smooth. Always remove the items while still slightly damp and hang to dry. If you don't mind wrinkles, there is no particular skill-set to removing clothes from a dryer. Scoop them out and pile them in a basket and you're ready to go. However, if you would rather take a few minutes as the clothes come out of the dryer to fold them correctly; you'll save lots of time later when you don't have to iron. If you leave clothes in a basket or heap, the weight of the pile will only cause wrinkles to set in more deeply. As soon as you remove a piece of clothing or linen from the dryer, give each item a strong snap to remove any clinging smaller items and start smoothing out wrinkles. Shirts and blouses should be hung on a proper hanger and the seams, collar, cuffs, and button plackets should be pulled straight to smooth out the wrinkles. If the shirt has gotten too dry, a fine misty spray of clean water will help loosen the fibers. Clothes and linens that cannot be hung should also be snap-straightened and then hand pressed on a flat counter. Then, fold neatly while continuously pulling any seams or edges straight. A fine spray of water will help relax the fibers, but don't let the items get too wet. Never cram clothes into an overcrowded closet or drawer right after washing. While the fibers are still warm or damp, they are still prone to easy wrinkling. Give your clothes space for air to circulate. Clothing should always be returned to the closet or drawer as neatly as possible after wear. In most cases, shirts, pants, and skirts may be worn a few times between washes. After wearing, hang garments so air can circulate to help remove moisture, relax fibers and lessen wrinkles. If clothes are slightly wrinkled after storing them or removing from a suitcase, you can steam many wrinkles out by running a hot shower and letting the items steam for a while. You can also reduce wrinkles by wetting a white, woven cotton towel, wringing out excess water. Toss the towel and the wrinkled item in the dryer and tumble for about 5 minutes. After removing the garment, immediately hang it correctly. You may not need to grab that iron after all. You can also use one of the many wrinkle removers on the market. Just a quick spray of Downy Wrinkle Releaser or Magic Wrinkle Remover and you could be out the door. Again, allow the garment to dry after spraying before you put it on to wear. If the garment is damp and you sit down, you'll have permanent wrinkles. 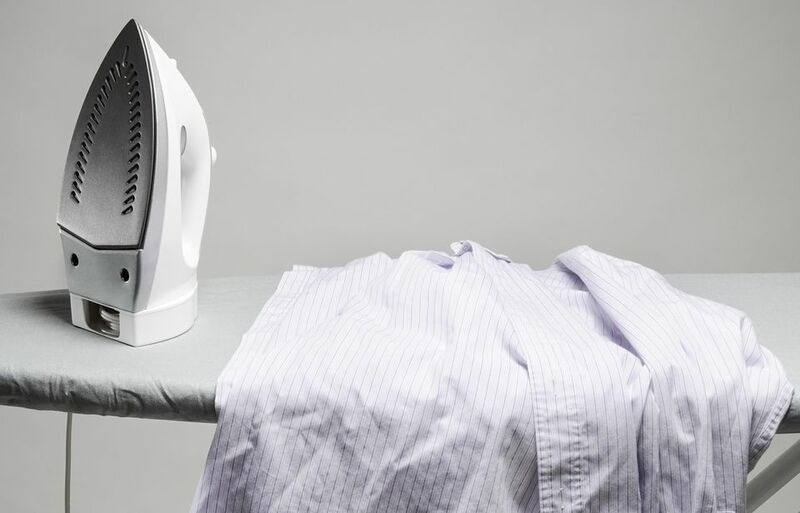 Are You Guilty of Making These Common Ironing Mistakes?